The Pacific War Online Encyclopedia: Bruce, Andrew D.
Bruce participated in the Aisne-Marne, St.Mihiel, and Meuse-Argonne campaigns during the First World War. He began the Second World War in command of the Tank Destroyer School, and assumed command of 77 Division in May 1943. His division was deployed to Hawaii in March 1944 and fought in the Marianas, Leyte, and the Ryukyus. 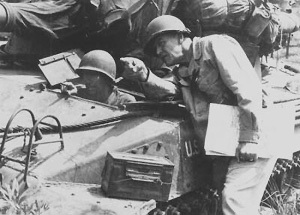 Bruce's division was one of the few to receive open praise from Krueger, and some observers rated it as highly as the elite 1 Cavalry Division. However, Hodge was suspicious of Bruce's ambition. During the Okinawa campaign, his recommendation that his division be landed behind the Japanese lines was rejected by Buckner. Nevertheless, Buckner thought highly of him, writing that "I much prefer a bird dog that you have to whistle in to one that you have to urge out. He is of the former variety" (Gandt 2010). Taaffe (2011) evaluates Bruce as the only senior commander of ground forces at Okinawa to show much tactical ingenuity.